This Is Your Brain. This Is Your Brain On Music : NPR Ed A new study suggests that learning to play a musical instrument helps improve the brain's ability to process language. 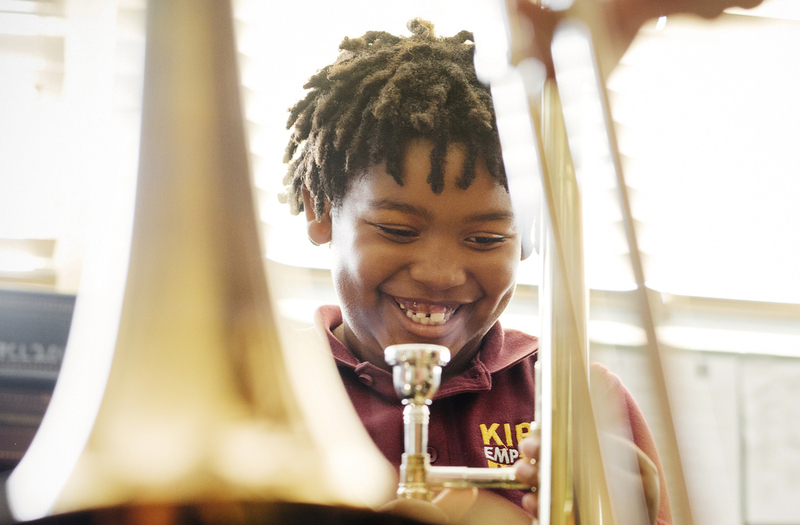 That means music lessons could give kids from low-income communities a big boost. Amir Pinkney-Jengkens, 8, is learning trombone through Harmony Project, a nonprofit that provides musical instruments and instruction to children in low-income communities. 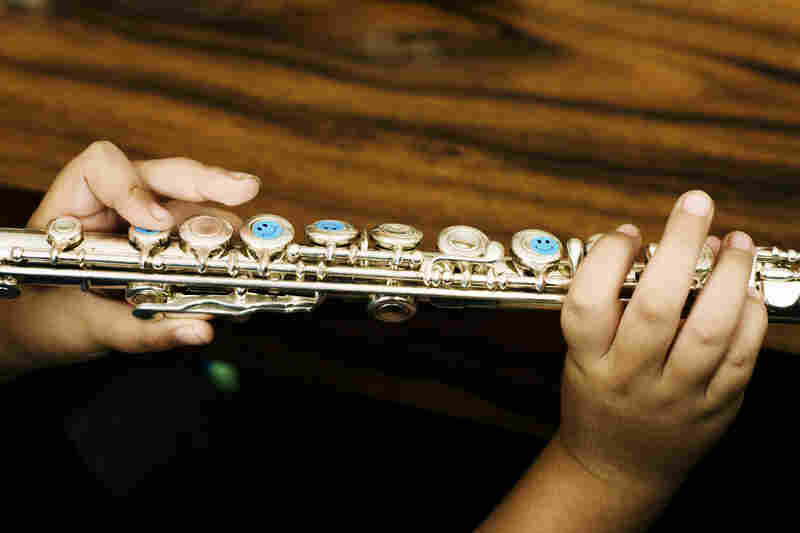 Recent research suggests that such musical education may help improve kids' ability to process speech. 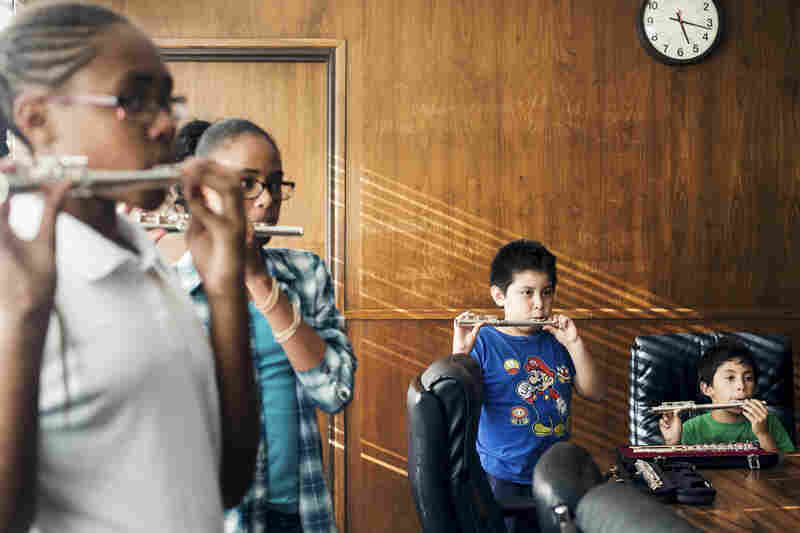 A class for beginning flutists, crammed into an office building boardroom, labor over "Hot Cross Buns." 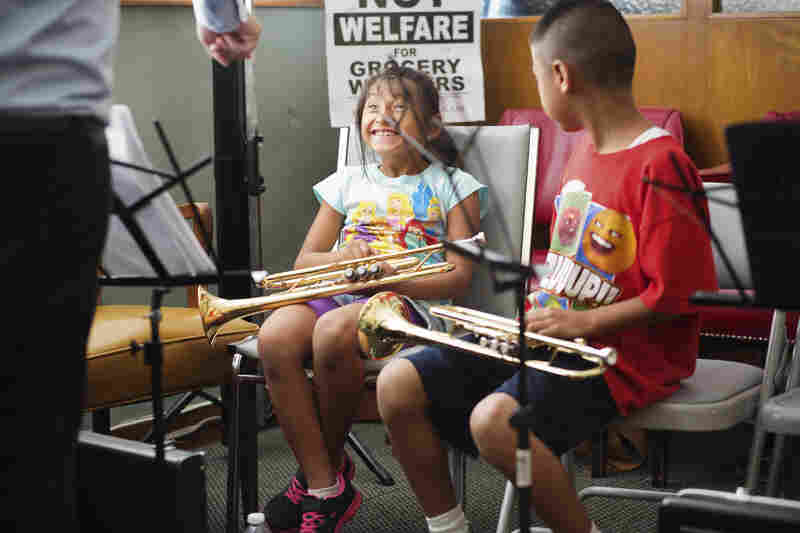 It's part of Harmony Project, a nonprofit program offering music lessons in a wide range of instruments — flute, trombone, trumpet, oboe, violin, cello, drums — to kids from some of Los Angeles' poorest neighborhoods. The instruments are provided, and the lessons are free. These students attend classes at Harmony Project's headquarters in Hollywood, Calif. The walls are thin; a few of the windows barely close. 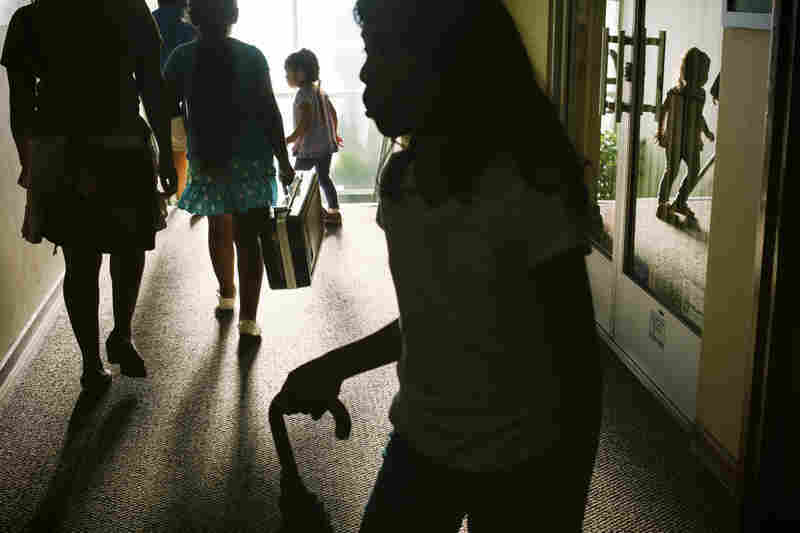 At 5 o'clock, staffers simply surrender their offices to the kids and their teachers. Forrest Powell, left, and his trumpet students are packed shoulder-to-shoulder in one office-turned-practice room. Student Cinee Hong eagerly waits for flute instructor Kathleen Ellingson's attention. 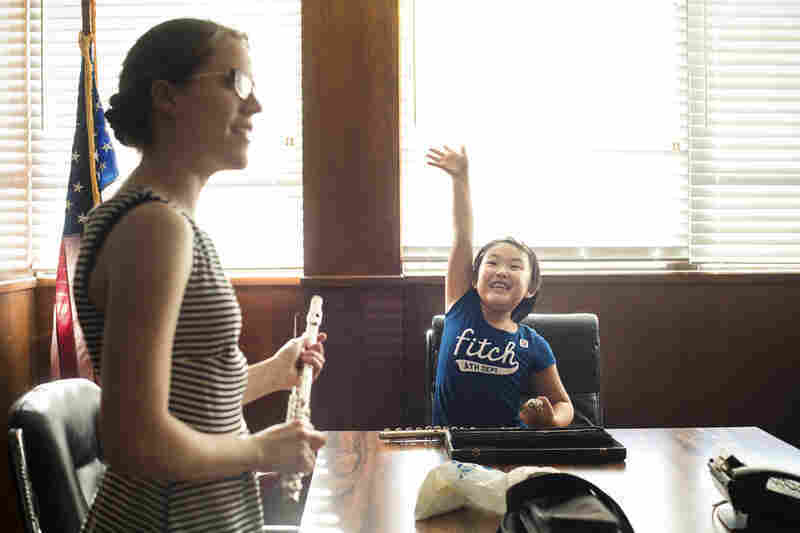 Ellingson, a recent graduate of the University of Southern California, says when she's not teaching kids at Harmony Project, she's giving private lessons or working in the office of a local flute repair shop. Ellingson, the flute instructor, is a big believer in the power of stickers to help her students remember where to place their fingers. While Harmony Project students head into their practice rooms, the second-floor hallway fills with parents and siblings who wait for an hour — reading books, playing video games, or entertaining each other. 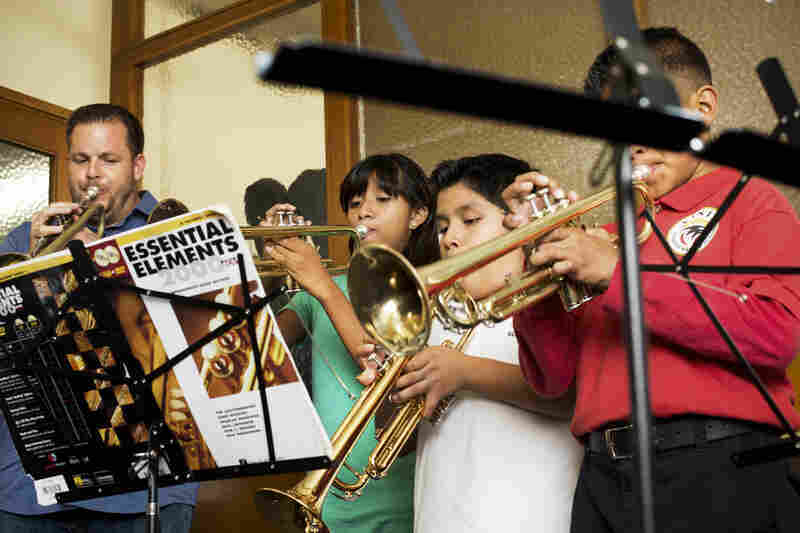 Esmeralda Martinez, center, demonstrates good trombone posture. 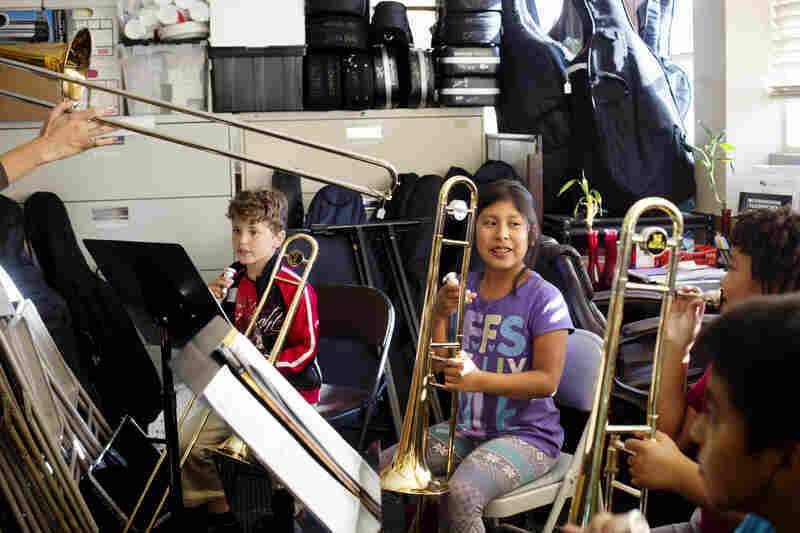 Her practice room is an office and storage room by day which requires the kids to squeeze in between filing cabinets, folding chairs and stacked instruments. Trumpet teacher Danny Levin gets a laugh out of Katie Vela, left, and Andres Lopez, right, as he demonstrates what their chins should not be doing while playing. Around 6 o'clock, the beginners retreat to the hallway, rejoin their parents and siblings, and head home for dinner and homework. The kids are expected at lessons two to three days a week and to practice daily.